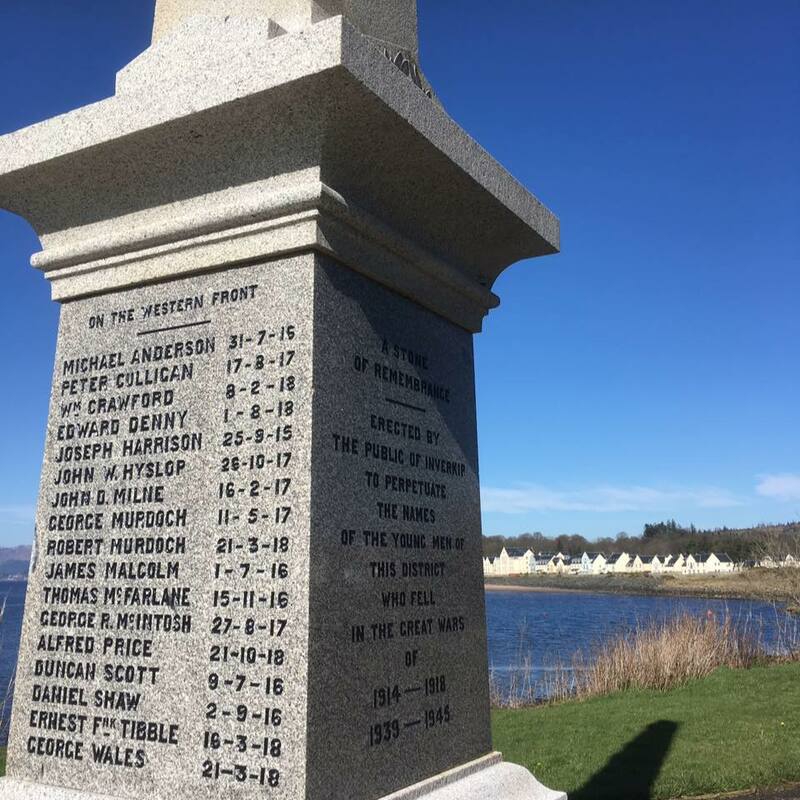 We are delighted that the Inverkip War Memorial Project will be holding their Exhibition at the Library in the Hub this November 4th to the 25th. The Exhibition is on the research of the falling soldiers named on the Stone of Remembrance in the Village. The obelisk freestanding memorial, names 29 local men whom served and gave their lives in the First and Second World Wars. The project was set up to bring the memorial to life and tell the stories behind the names and ensure we never forget them. In memory of Private Alfred Price, remembered on the war memorial. Alfred was born in 1877 at 53 Kelly Street, Greenock. His mother was Agnes Price m/s Carruthers, a laundry maid and widow of Joseph Price of Inverkip. Alfred is listed as illegitimate on his birth certificate. Joseph and Agnes were married by Rev Peter Douglas of the United Free Church, Inverkip in 1860. It appears shortly after this, they moved to Abernethy, Perthshire. They had a daughter, Flora, born in Abernethy in 1861 but she died aged 6 weeks. Three other children were born, all in Abernethy in 1865-1867. A son, Matthew was born in 1869 but he died of bronchitis in 1870, not reaching his first birthday, in Inverkip. Tragically, Joseph died in 1869 in Abernethy and it appears Agnes and the children moved back to Inverkip shortly afterwards. More tragedy struck when another child, Joseph, was born in 1880 in Inverkip and died shortly afterwards. In 1881, the family were living at Main Street, Inverkip, with one of the daughters, aged 13, already out working as a servant to a family in the village. In 1884, Agnes died in Inverkip, leaving Alfred, aged 7, and the other siblings with no parents. On the 1891 and 1901 census Alfred was living with his Aunt, Janet Paul at Campbell Place, Inverkip. On the 1911 census, he had moved to Wemyss Bay and was working as a farm labourer for Andrew and Mary Thomson. Alfred served with the 1st/6th Battalion, Argyll and Sutherland Highlanders. He was killed on 15th October 1918, although is listed on the war memorial as 21st October. He is also remembered at the Avesnes-le-Sec Communal Cemetery Extension. Hilary Cameron, the projects driving force will also be holding a 2 minute silence on Saturday the 11th of November at 11am to remember the falling. All are welcome. You can follow the project on their Facebook page. Thank you to Hilary for letting us use her material and photographs for our blog post and we look forward to seeing the Exhibition soon.